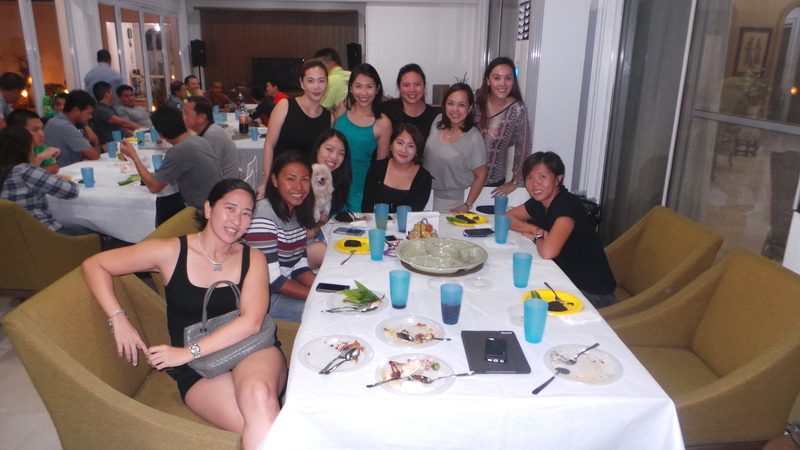 I had the chance to interview some of my teammates during the team’s send off party for them last Saturday. 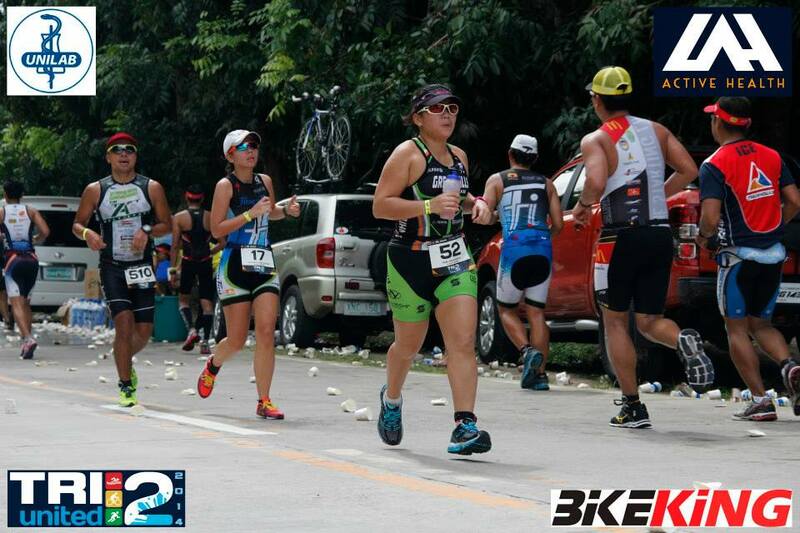 Each had different insights and strategies but the same goal of finishing the race injure-free. Let me share with you some of their answers to questions thrown at them during the party so you can get to know them better. Berns is an ultramarathoner who competed and finished various ultra events including TNF100. 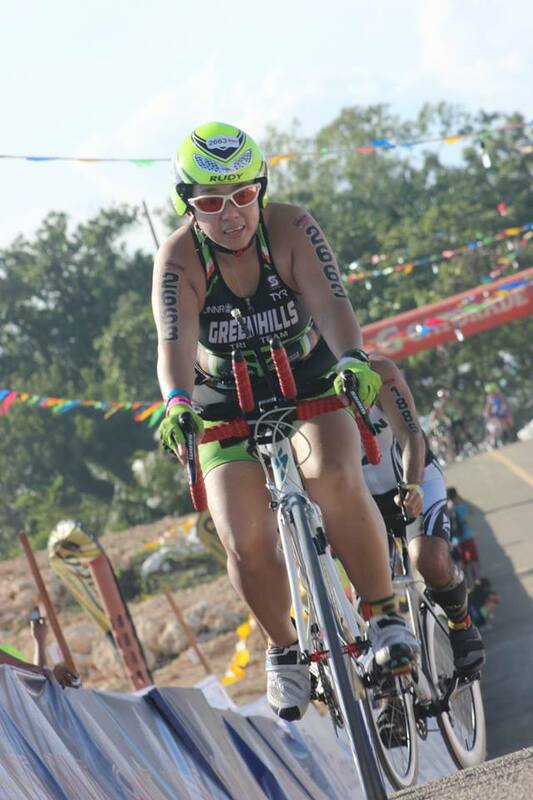 She is the only female representative of the Greenhills Tri Team who joined IM Langkawi. What made you decide to join? Aspirational. In my opinion, you are not really an IronMan unless we’ve completed a full IronMan distance. Why Langkawi? Closest to the Philippines and the timing is perfect. Since I started training in January, September would be a perfect time to compete. Do you have a coach and are you following any prescribed program? Yes. I follow Coach Dan Brown’s program. Doc Pete is an otolaryngologist by profession and has started joining triathlons a long time ago. 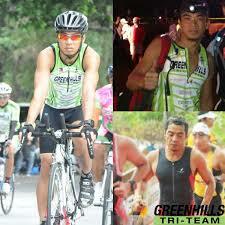 He is a member of the Greenhills Running Team. What made you decide to join? As Edmund Hillary said when asked what made him climb Mt Everest. Because it is there. In addition, peer pressure. 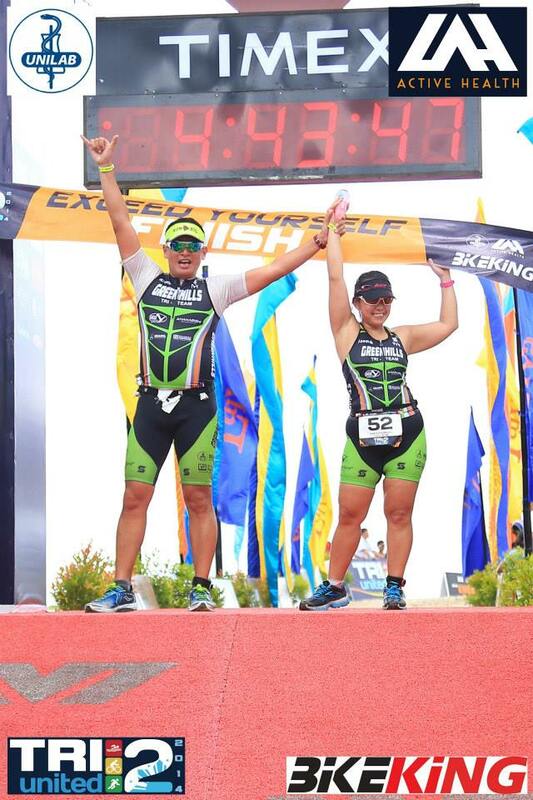 How many 70.3 distances have you finished prior to joining Langkawi? 10 but I also signed up for TU3 which is happening in October. 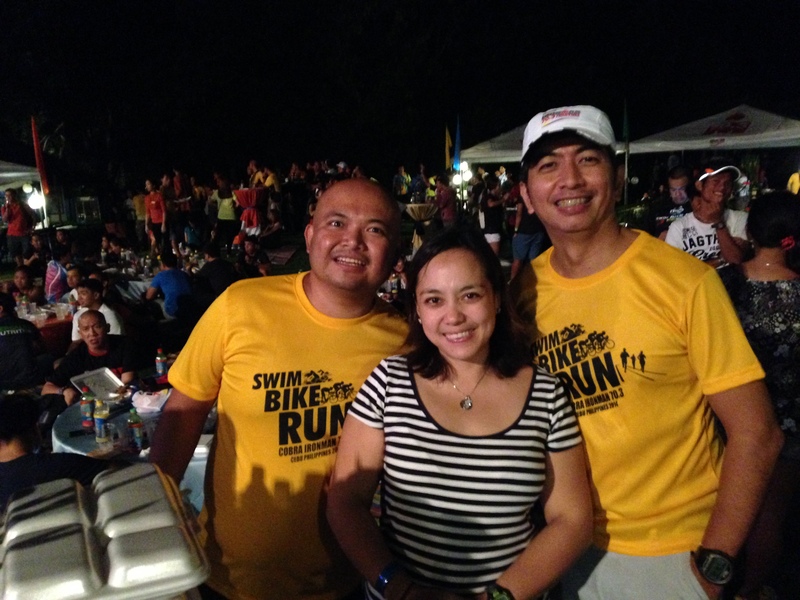 Oyster is a restaurant entrepreneur who started doing triathlons back in 2012. Any target time for Langkawi? None. Just to finish. How important is it to have a team when training? Very important. It kills boredom. For me, training is more difficult that racing. It is when you need the support of other people. How do you prepare yourself mentally? I don’t let this event be the source of my stress. No pressure as my goal is just to finish. How long do you train in a week? Weekdays a total for 6 hours. Weekends, 6-8 hours. 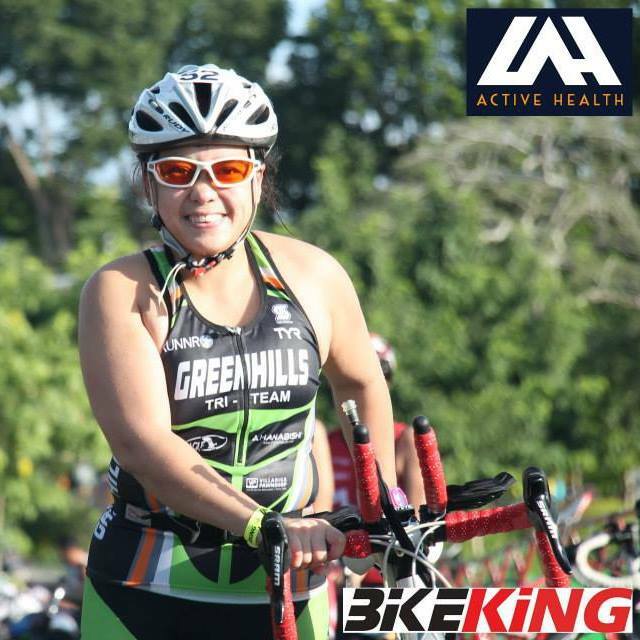 Jeng loves to bike. This is an understatement. 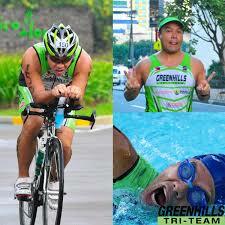 He is a businessman by profession and he started his triathlon “career” in 2012. Why did you decide to join? Because of Doc Peter. He asked me to so I said yes. Finished any full marathons? Not yet. Who is your inspiration? Doc Art. Kahit pagod na, nilakad lang nya yung last leg and he finished. What is your strategy to finish the race? Swim – survive cut-off. Bike – push it. Run – Run-Walk. What is your strategy for nutrition? Bike leg – Perpeteum every 20 mins and peanut bar every 30 mins. Quiet, reserved but deadly. KK is one of the most dedicated athletes in our team. 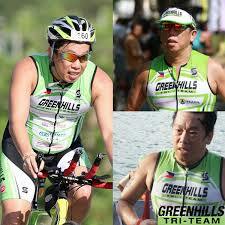 He designs boats for a living but eats and breaths triathlon. 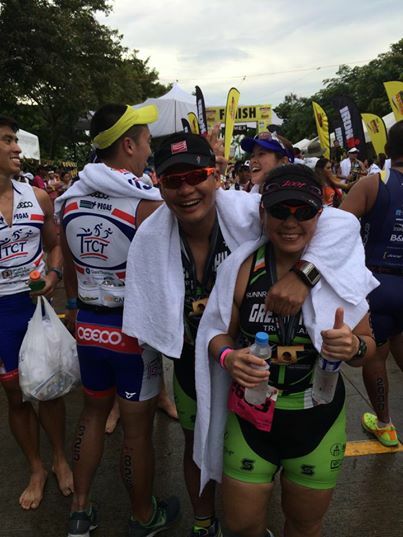 When did you start doing triathlon? Last quarter of 2010. I have joined over 15 races. Any full marathons under your belt? Trail. TNF50. My toughest race. What is your race strategy? 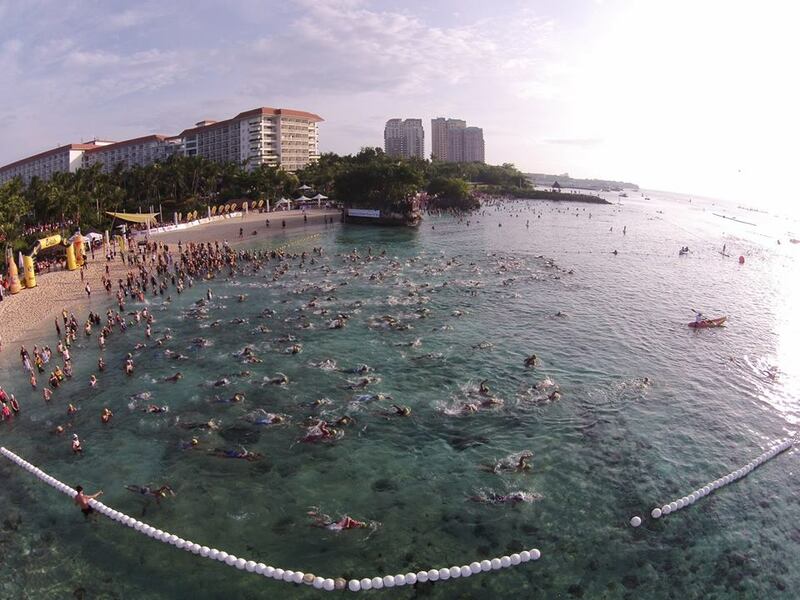 Swim – Drafting, avoid the pack and stay away from the buoy and lane lines. Bike – maintain a speed of 30-33kph flat portions of the course and 40kph+ during downhills. 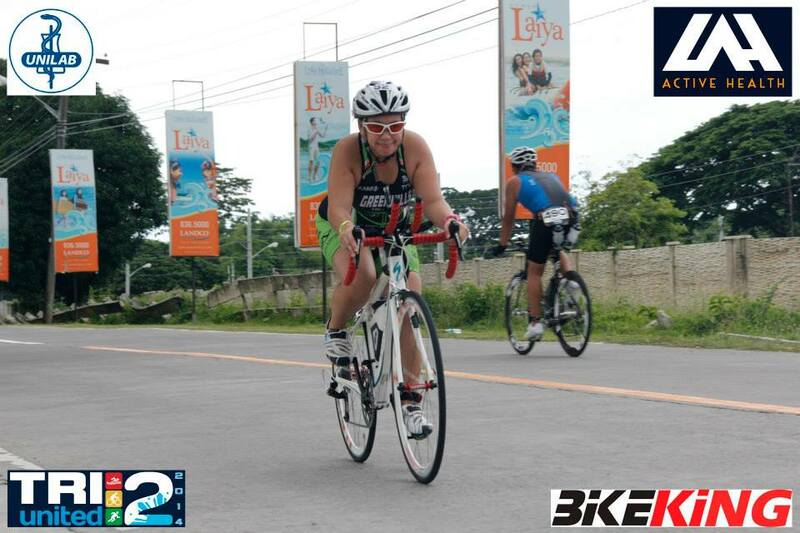 Emer is an ultramarthoner first and a triathlete second. But in my book, he is an “ultra” endurance athlete. 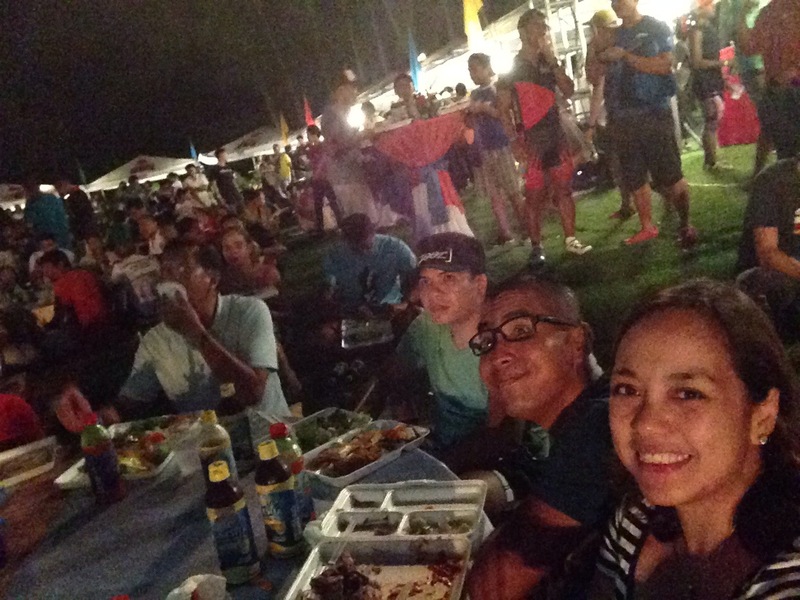 He has finished the very tough Bataan Death March 102 and has found a new love in traithlon. Is this your first full IM? No. Jeju Korea was my first. 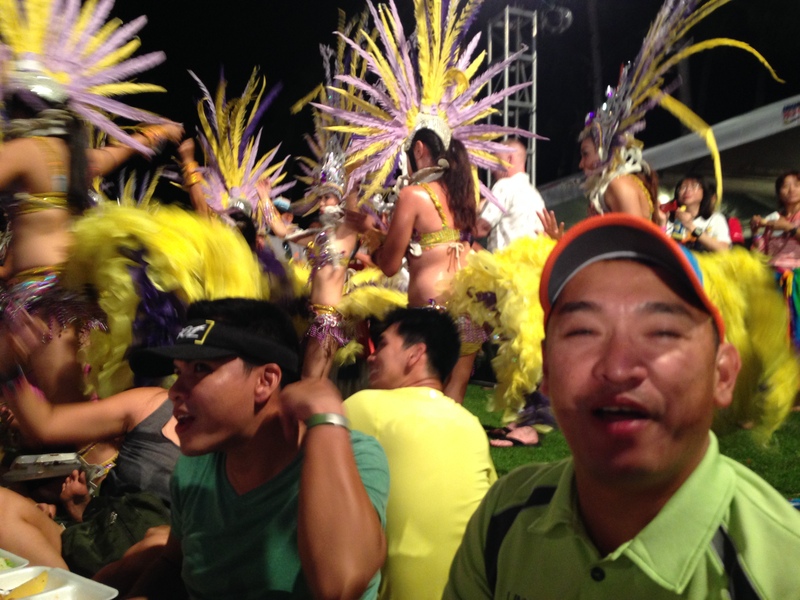 Why choose Langkawi to be your 2nd foray into this sport? Closest to Manila plus I was pushed by Uncle Willy (Yao) to go. What’s your strategy? Just have fun. Eat when you’re hungry. Stop and rest if you’re tired. You feel that you’re ready? YES! I have known Doc Art close to five years now. And believe me, this guy is all about endurance. 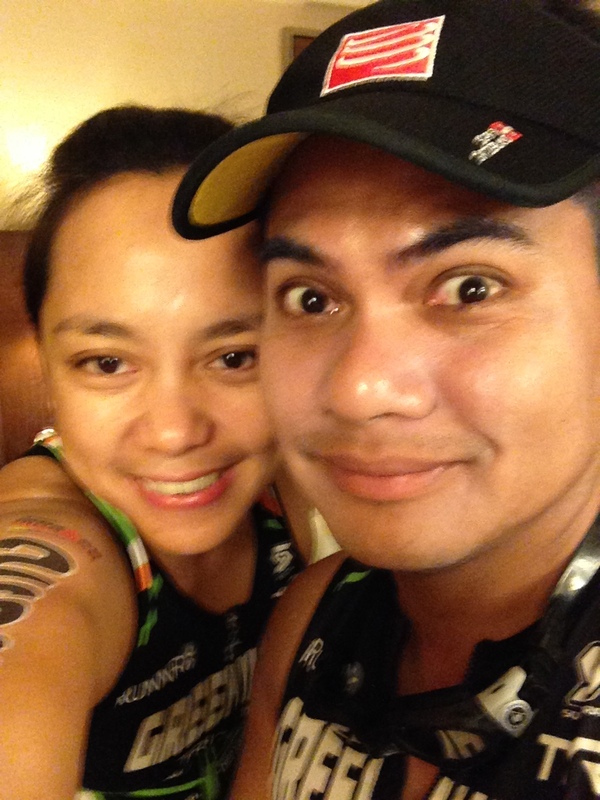 He has completed the Bataan Death March 160 and several full IronMan distances. 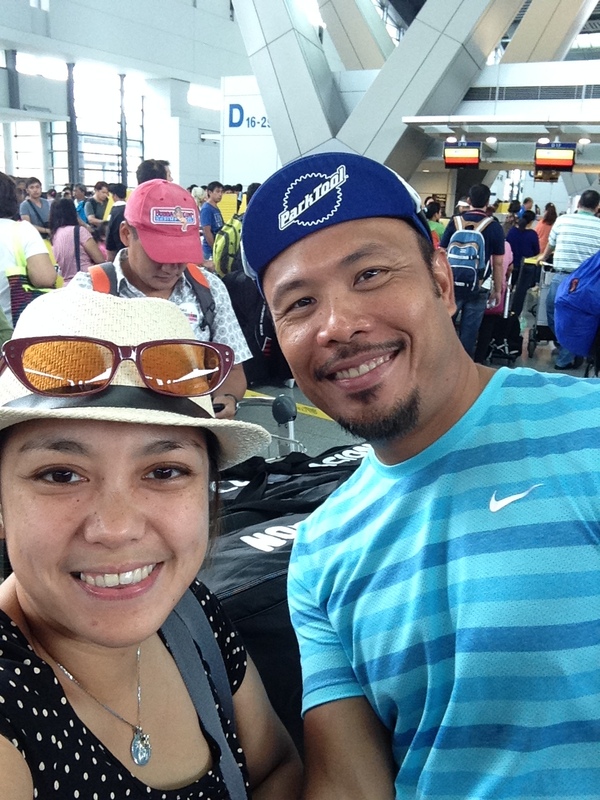 Together with Emer, he is also an “ultra” endurance athlete. Doc Art is a pediatrician by profession. I heard that this is not your first FM distance? Yes. This will be my third. My first two were Metaman Bintan 2012 and 2014. What is your weakest discipline? Swim. And your strategy? Allow the strong ones to go ahead, swim in clear water. For bike, stop at every station for at least 2 minutes to eat and drink. Breakdown the race so that you look forward to the next station instead of the finish line. For run, I will walk constantly with a speed of at least 6-7kph. Tips: It’s achievable, if you believe you can. Uncle Willy is simply amazing. He is the oldest representative of GHTT to Langkawi. 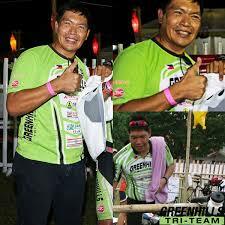 A true inspiration to all, he completed 66 full marathons and has completed several ultramarathon distances. Is this your first full IM? Technically no. I had two previous attempts. The first one was in Jeju Korea, second was at Western Australia. Both instances, I injured myself a few days before the race which resulted in two failed attempts. This is my first time to join without any issues. How old are you Uncle Willy? I am 64 years old. When did you start training for this event? April this year. Longest distance you’ve ran? Bataan Death March 102. And your strategy? If you feel tired, switch to breastroke. Your nutrition? Erito, sandwich, Vitargo, a carbo drink I discovered. Only Oyster is not serious…Haha! The GHTT Langkawi Team in serious discussions about the bike route. The ladies of the GHTT Team. Berns Tan to the far right. 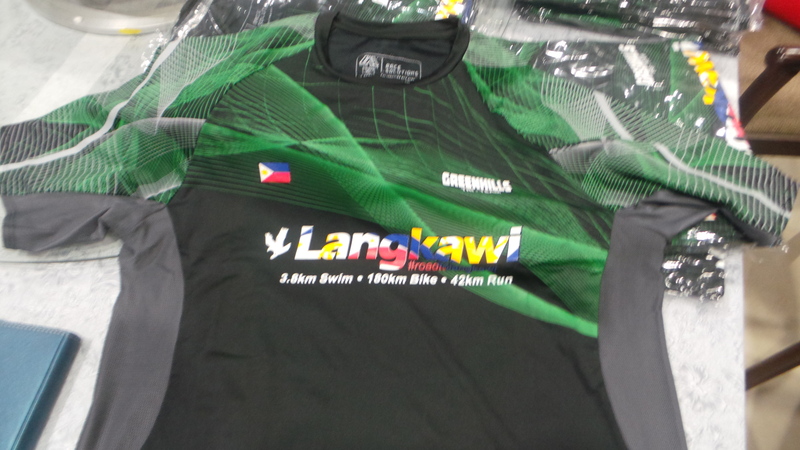 Customized GHTT shirts for the Langkawi participants. 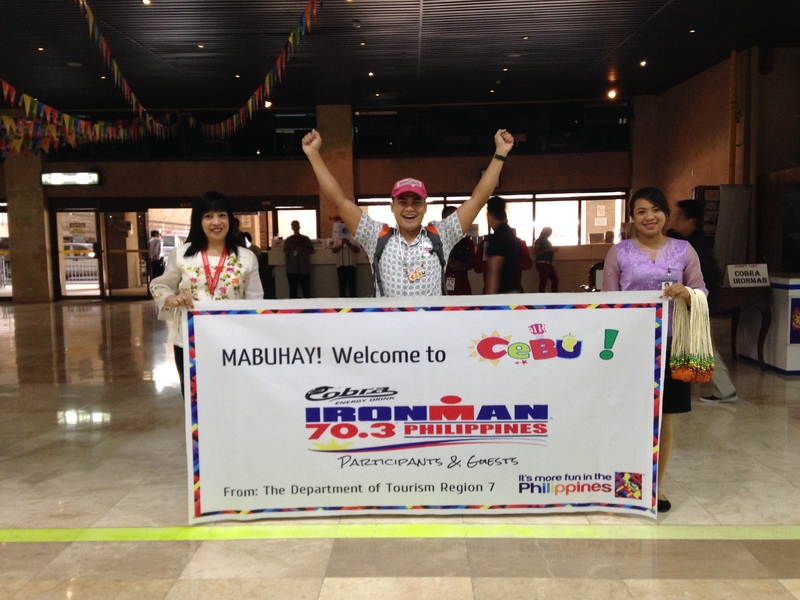 I am amazed at the perseverance and dedication of people who join full IronMan races. I know how difficult it is to train for a 70.3. Double the distance means double the training, double the pain. These individuals have truly inspired me. 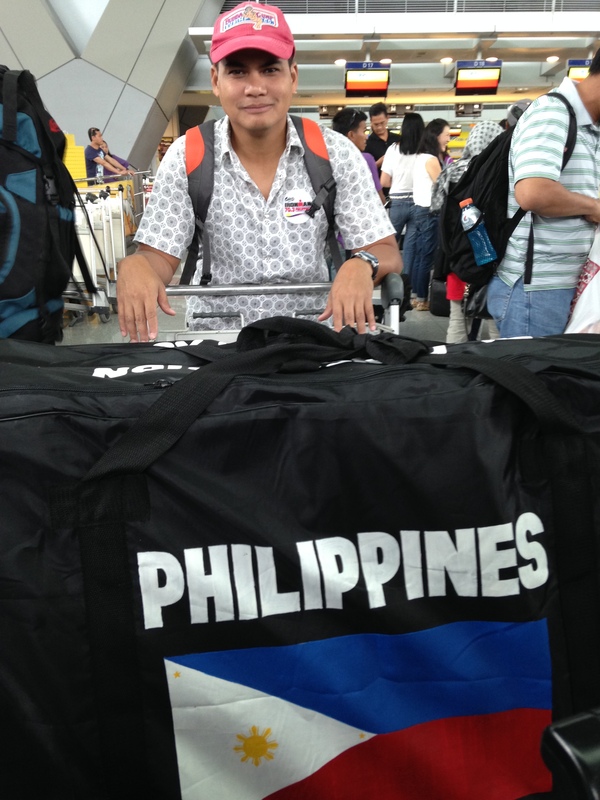 Good luck to my teammates and to all those who are joining the IronMan Langkawi, Malaysia. My God be with you on this journey. Stay safe! 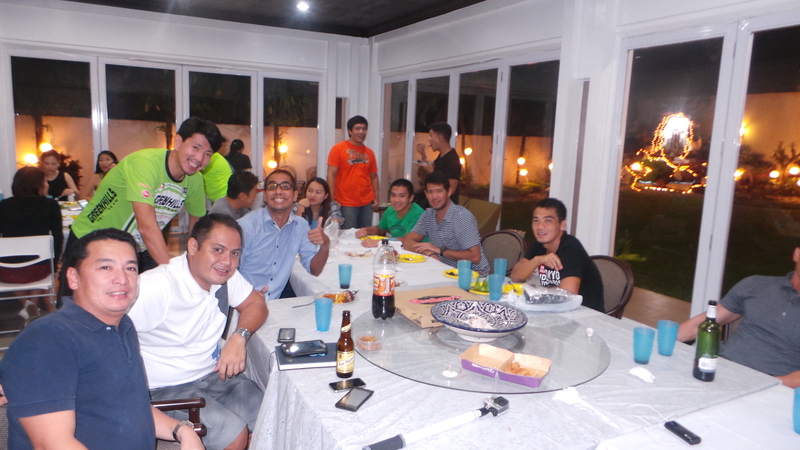 Race smart team! BRING HOME THAT MEDAL!!! 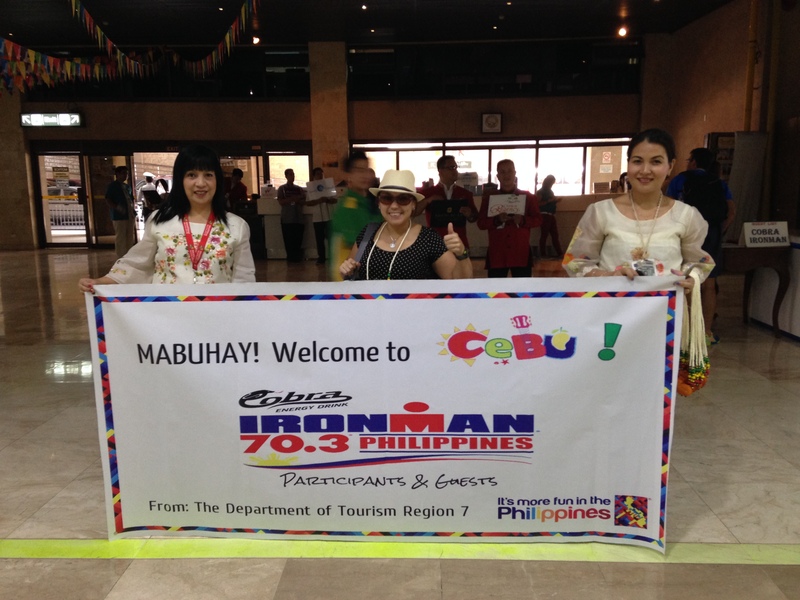 Manila, Philippines 18 September 2014 – 119 Filipinos are set to participate at the IronMan race to be held of September 27 at Langkawi, Malaysia. 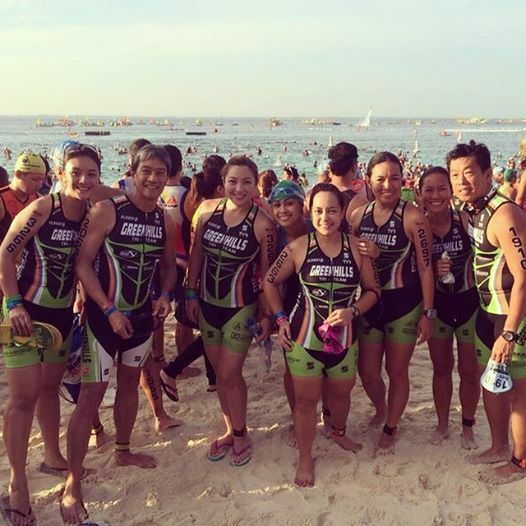 Triathletes with varying profiles and athletic abilities, these group of Pinots have bonded together to form what is now the largest and second Philippine contingent ever to compete in a full-IronMan distance race outside the country, the first one being the 90-member team which went to race at the IronMan Asia Pacific Championship in Melbourne, Australia last March. This year marks the return of the IronMan race in Langkawi. 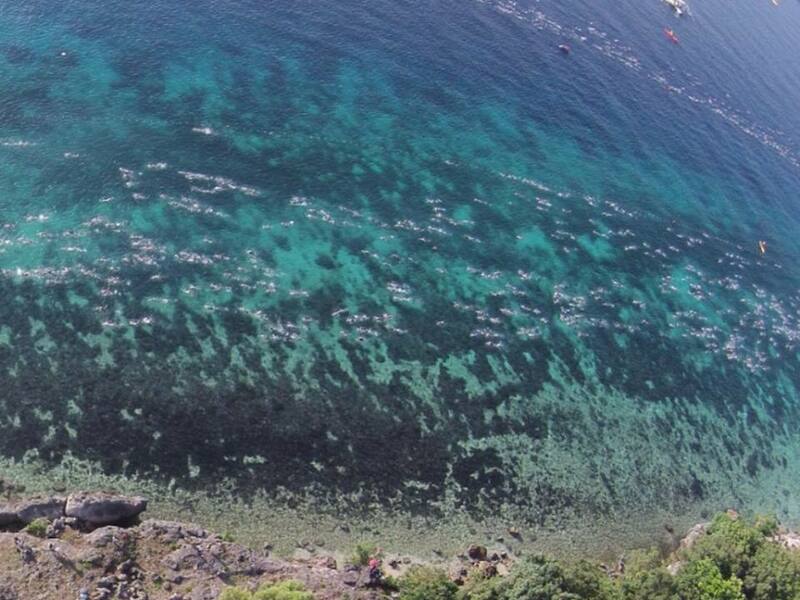 Lagkawi Island is located within a cluster of tropical islands that attract visitors the world over. 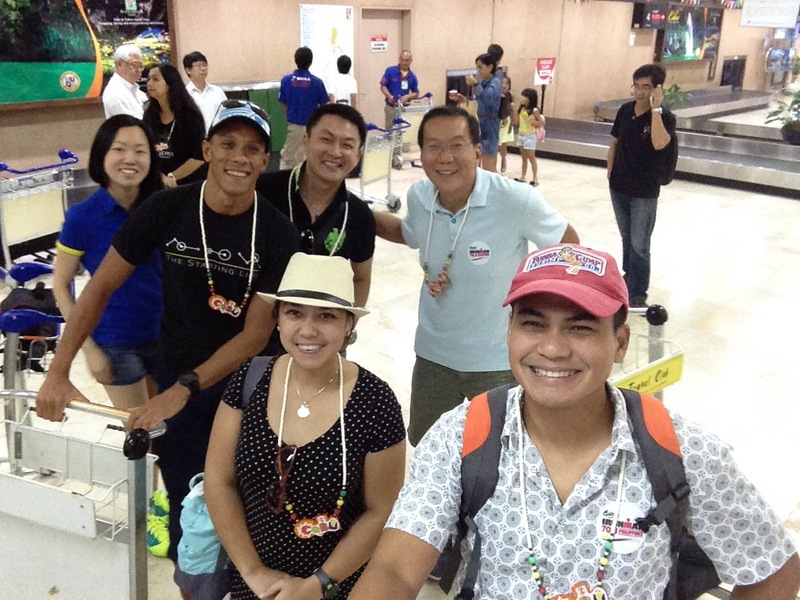 Our Pinoy triathletes together with other participants, are set to embark on a truly Malaysian cultural journey through a 3.8K swim, 180k bike and a 42.2k run on tropical, hilly and demanding terrain passing traditional kampungs (villages), mangrove clusters and rainforest vistas. 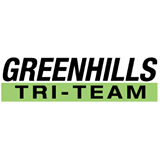 The team, organized by Triathlete and RP Paratriathlon Team Coach, Vince Garcia, is composed of mostly first-time IronMan Langkawi participants and a number of second and third-time participants. 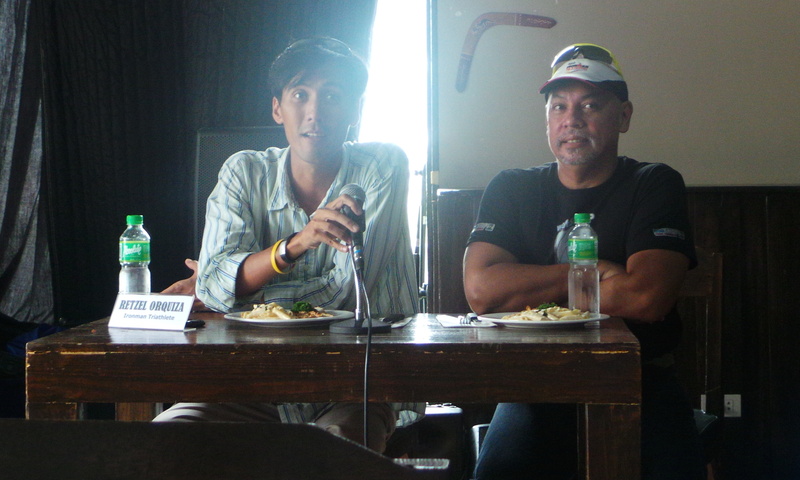 They just held a press conference at the Skippy’s Bar and Grill located at Bonifacio Global city, mainly to send out the message that passion for Triathlon as a sport has truly grown in the country within only half a decade. 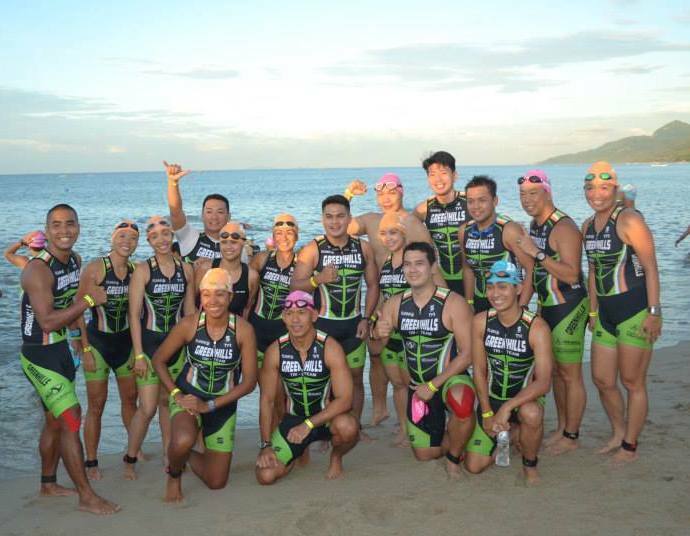 Sunrise Events Inc., franchise-holder of IronMan races here in the Philippines has expressed full backing to the contingent. Princess Galura, Project Director of SEI said, “SEI will continue to support Filipinos competing in Iroman races all over the world”. 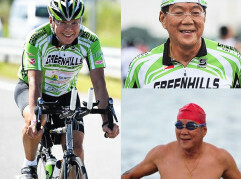 Apart from Coach Vince, some of the notable members of the Pinoy contingent to Langkawi are celebrity triathlete Drew Arellano, UltraRunner Willy Yao who at 60+ is the most senior member of the group, the youngest being Charles Lazaro who is 21 years old and Cobra IronMan 70.3 2014 Filipina Elite Joyette Jopson. 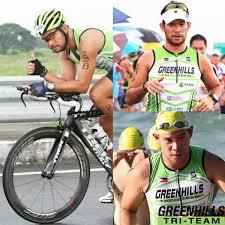 Some of the triathletes competing in IM Langkawi (L-R Ivan Fojas, Carlos de Guzman, Julian Valencia) Carlos de Guzman will skip this year’s event as he has previously done it. 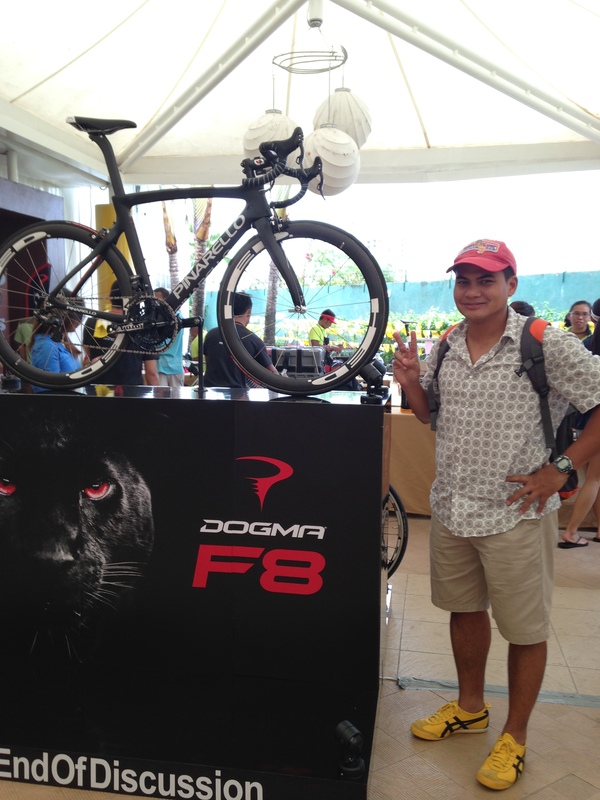 The IronMan Langkawi is a qualifying race to the 2015 IronMan World Championship in Kona, Hawaii with available 40 slots. I woke up at 2am. I couldn’t sleep. I guess this is normal for most but seriously, every since I started TRI-ing, I almost always get as much as 5 hours of sleep before a race. My migraine kept me up as I found myself tossing and turning trying to think of hundreds of reasons why it should just go away. I prayed to God to make it go away. Finally at 4am, I decided to give up and start preparing for my long day. I opened my bible and started to reflect on the day’s readings which I already knew having heard anticipated mass the day before. 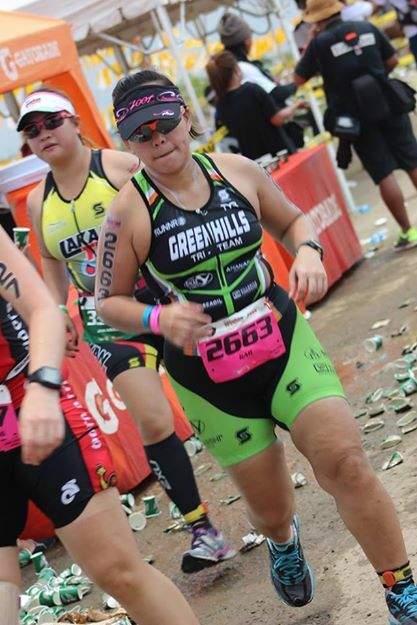 About two weeks before race week, I developed Gastroesophageal reflux disease, or GERD. I blame it on hours of training on the bike without eating anything prior to training. 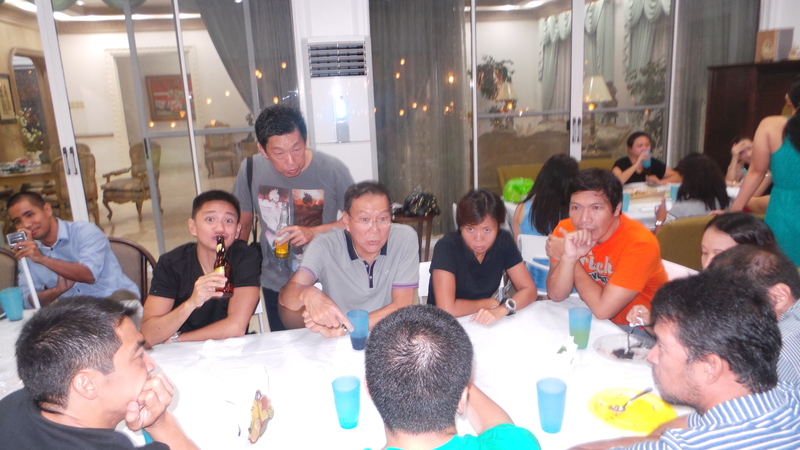 So this time I would make sure that I consume something light before the race. Noy pre-ordered a health omelet and some bread which the hotel promptly delivered at 430am. While munching on some of hubby’s breakfast, I prepared myself mentally for a grueling race. 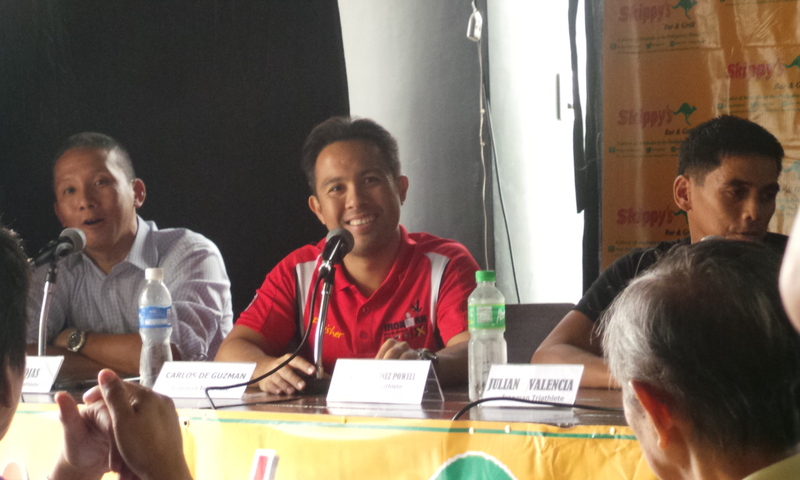 I repeated what Coach Ige Lopez told me, a week before Cebu, mentally several times. He said – you have done your homework, you’ve done your mileage. You will be fine. Yes, I will be fine. I will be fine. After a quick shower, I put on my trisuit, tied my hair, collected my transition bags and waited for Noy to be ready while doing some deep breathing exercises. We headed out as soon as hubby was done putting on his make up, oh I meant his sunblock. Before heading out to face our demons. Gulp! A few minutes before 5am and the place was already packed. We were thankful that the rain didn’t pour the night before. Our bike covers were dry. I used this as a lining before I laid down my bike and run gear to protect them from getting dirty. Yes, I am OC that way. 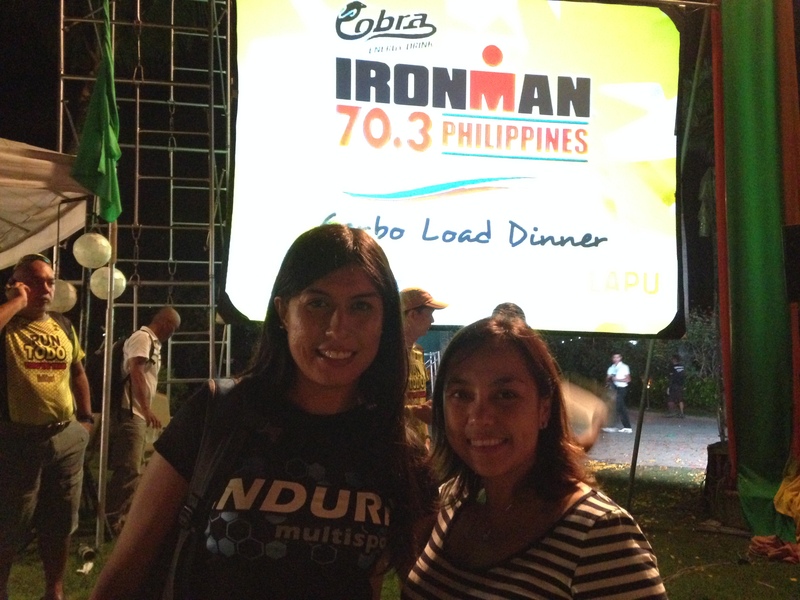 I headed to the beach to look for my teammates and bumped into Edith of Team Endure at the little girls room. We saw Caroline Steffen, who I did not know at that time. 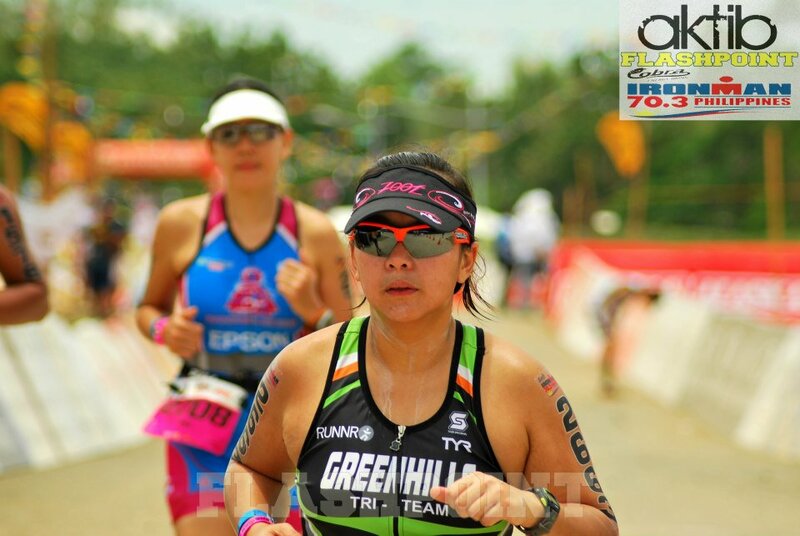 Newbie triathlete here. Finally at the beach, I saw my teammates who seriously are the source of my tri-strength. They push, support and keep me grounded. And most of all, they make me laugh and want to train. Being a member of GHTT is so much fun! I saw my good friend Janis getting ready for the swim as well. I lost Noy as I headed towards the beach and when I saw him again, I gave him a big hug and told him to stay safe. And finally his wave was being called. And after a few minutes, it was our turn. 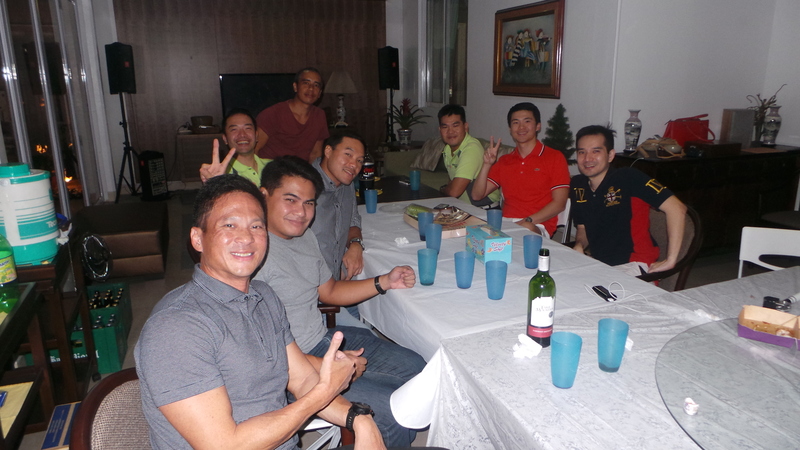 As part of wave 5 – the last wave, I felt that we were at a disadvantage as cut-off was set 70 minutes after our wave. This means that earlier waves get additional time for their swim. This was what bothered me the most. I want to make sure that I do not get cut off or else I would’ve been heartbroken and my training was for naught. 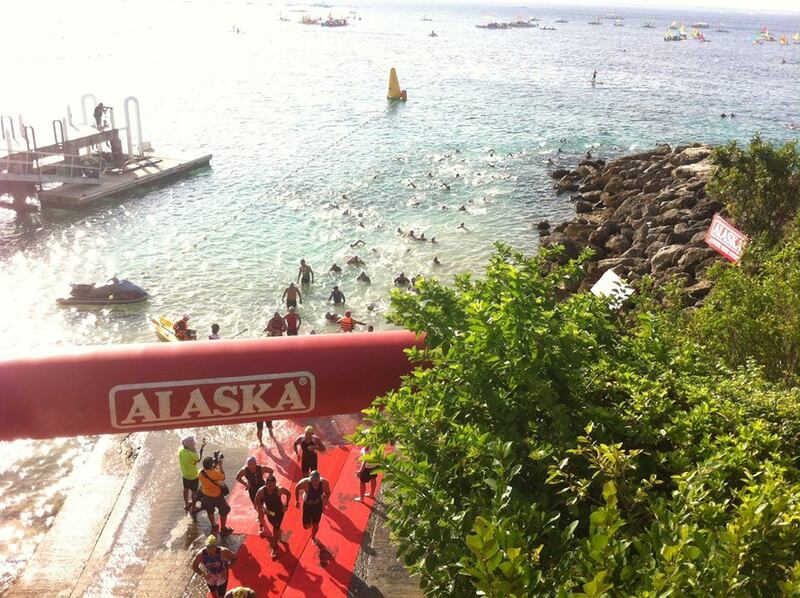 It was a floating start so we had to swim a few meters before the starting area. I lost my teammates and ended up with Edith and Kira of Endure. Seriously, there were so many people! When it was time to swim, I couldn’t make my way forward. So many people going left, right, doing breast stroke, kicking, pushing. Oh wow! I got kicked numerous times but I didn’t let it get to me. I wanted to swim with Kira as she called me and asked if we can swim together but it was impossible. There were just too many people! I started to swim away from the crowd, away from the swim line and finally found my rhythm. Aside from the pushing, pulling, kicking I experienced earlier, my goggles started to leak. Oh boy. 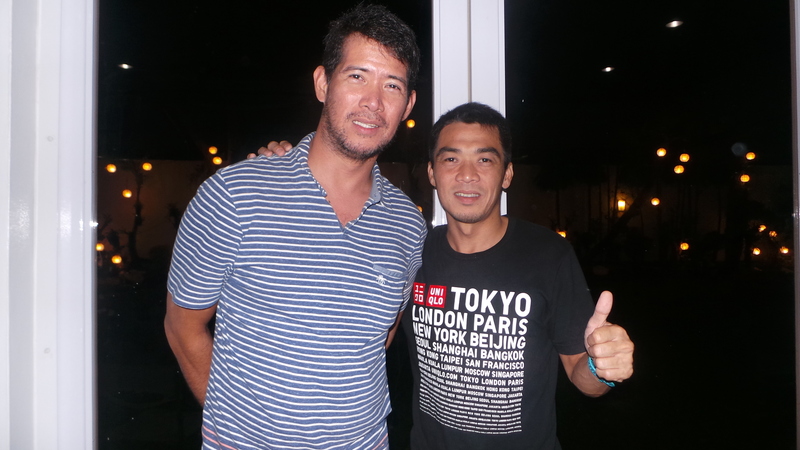 But Coach Nonoy Basa was in my head. Just enjoy the swim. If your goggles leak, then fix it. Oo nga naman! So fixed it I did. Several times I had to tread water to fix my goggles. This will be a long day I said to myself. Finally the 2nd to the last turn before the finish. Hey cool. I’m almost there! I can see the last buoy before turning towards the swim finish. I was wondering why some of the marshals in the boats were calling out to me. 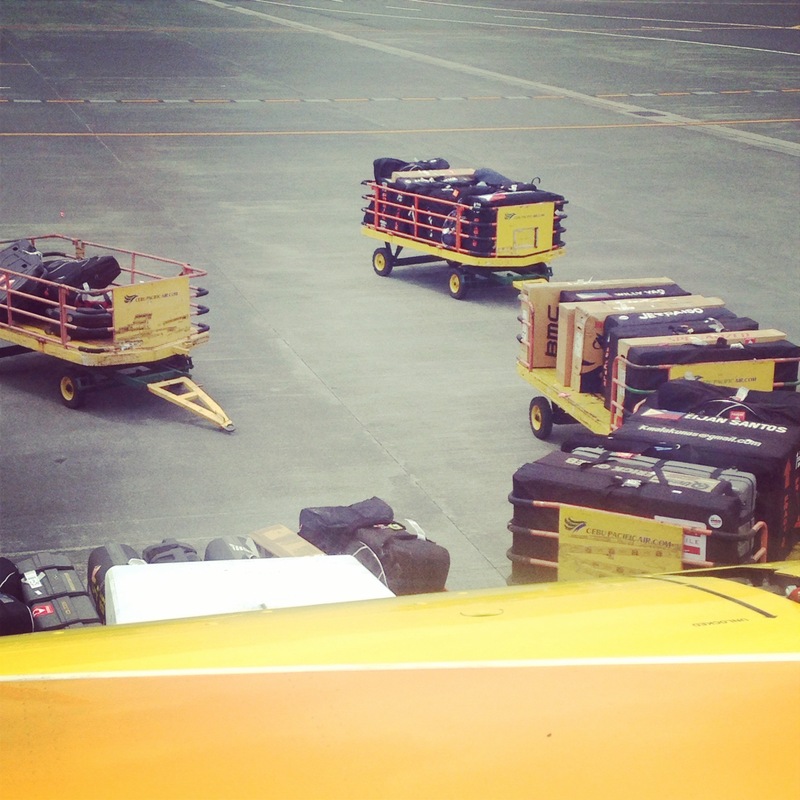 As I turned to my left, I saw that I missed the ramp. I was suppose to swim diagonally towards it. Stupid! I did it again. I almost got lost again. I didn’t know if I made it. But there I still see dark blue even light blue caps (male age groupers which were in earlier waves) in front of me. My watch registered 55! Yes! I did it. I rushed to T1. I made it! This should be an easy 90k bike. James (Rosca) did say it was a flat course. I wanted to make sure I had everything before heading out. Drink water, pour water on feet, consume gel while wiping feet, hydrate, put on shoes, race bib, helmet, bike. Oh I forgot my gloves. Go back, gloves. Shall I re-apply sunblock? No time for that. Oh my shades. What do I use? The dark one or the lightly tinted one? Oh I should use the light one coz of the dark tunnel. Finally, off we go. Can you see my lopsided helmet? Haha! Thanks for the photo aktib! Please don’t make me fall. Please don’t make me get a flat. 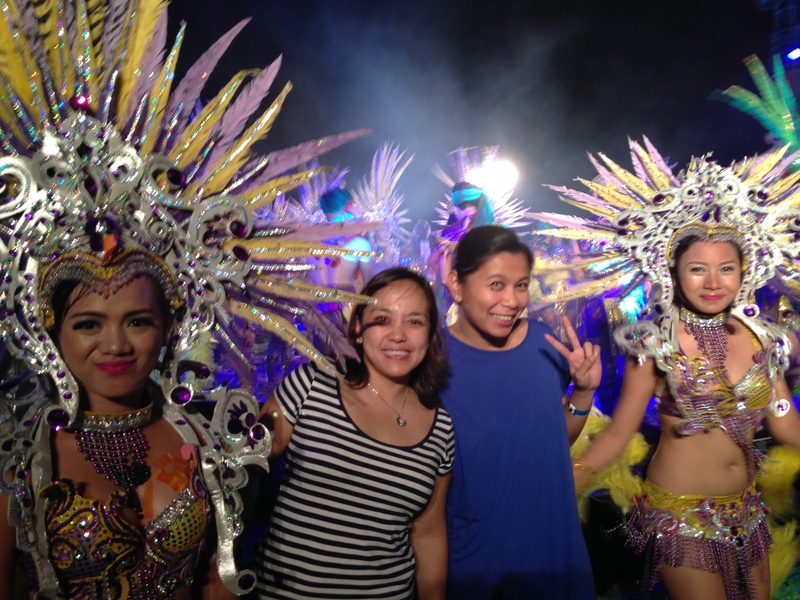 Those stuck to my head as I headed out of Mactan Newton. Then tok, tok, tok, tok, tok. What is the f*cking sound! Shall I stop to check? No, you’ll lose momentum and lose precious time. As if my deciding-what-shades-to-wear activity didn’t do that already. That’s transition. That does not count. Funny how I can recall the argument going on inside of me. I decided not to stop even if it was bothering me so much. Now where is that bridge? Aha, there it is! I started to increase my speed so I can generate enough momentum, getting myself ready for the climb. Uhoh, in front of me was a sharp curve towards the right before the bridge. Ugh, I had to slow down losing all the momentum I had generated. With almost no momentum, I started my slow climb. Spin, spin, keep your cadence up. I can’t! I shifted to an easier gear and climbed slowly. I then heard someone call my name. It was Nicky from Rock N Road. I screamed back – “May ingay sa bike!” As if I can hear his reply. Oh well. At least I was able to air my concern to someone. Finally done with the bridge, I worked my way towards the SRP for the double M loop. I was starting to enjoy the ride. 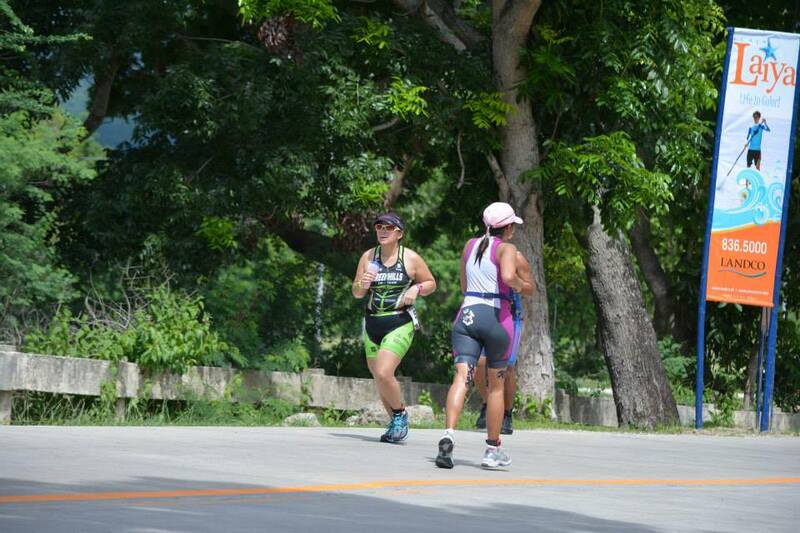 Sure, my head was still painful but hey, the tough part is over, I can now relish Cebu’s flat roads, I told myself. Flat? Flat? No way! I had to go up another bridge which looked a bit steeper than that of Marcelo Fernan. It was shorter though. I pushed hard. Kicked and pedaled my way to the top. 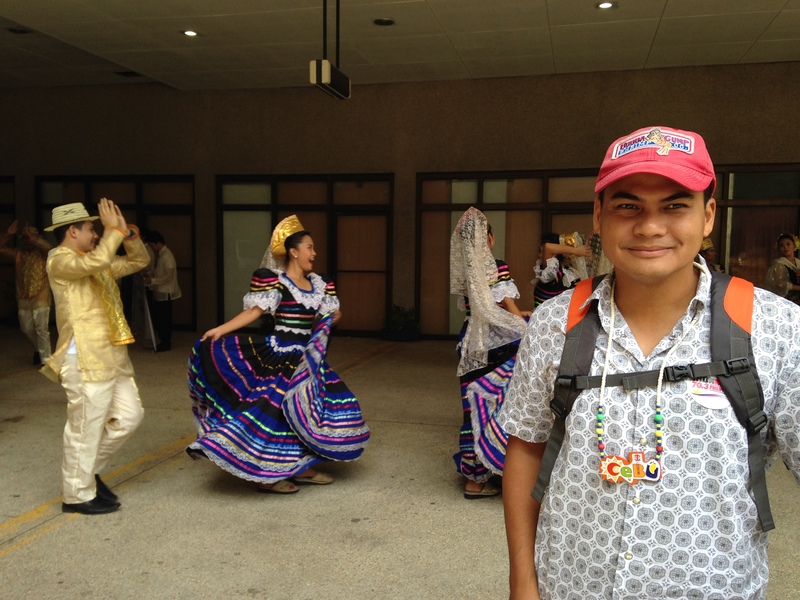 You can do this – You climbed Bugarin, Mabitac, went to Real Quezon. This is nothing. I told myself. After climbing that bridge, I got disheartened. This is not the flat course I was expecting. My head was throbbing. Then here comes the headwind. So this is the headwind James was telling me about. I was on top of the bridge scared to death that I might be blown away. That’s how strong it was. I cannot honestly recall which came first the bridge or the dark tunnel but both freaked me out. I cannot believe that I have to go through this eight times to complete the double M loop. As we were heading down from the bridge, an athlete on his/her bike, a few meters ahead of me to my left, started to sway which eventually led to him/her falling. I heard a scream to my left. Another athlete was moving too fast to stop that he ran over the athlete who fell. Thankfully I was able to maneuver my bike to the right avoiding an imminent crash. Brilliant! I was this close to getting into an accident. I was obviously shaken by the event. I forced myself to relax and just enjoy the scenery. I recalled that during the race briefing, it was mentioned that the double M loop was 45k of the 90k. I was only at 25k. It’s going to be a long day, I told myself. I couldn’t even smile when hubby shouted my name. I was feeling that awful. Finally, at km 50 after a female triathlete from Polo Tri overtaking said to me – “What is that horrible sound?”, I I decided to pull over and check my sensor. I had a feeling that my sensor was hitting part of my wheel creating that nasty sound I had to endure halfway through the race. As I was dismounting, my head started spinning, I was so dizzy that I had difficulty focusing on the task at hand. After a few minutes, which felt like seconds, I adjusted my sensor, mounted my bike and got back to the race. Hooray! No more nasty sound. I lost so much time already so I picked up the pace and started overtaking people. I can recall a happy moment, as I was climbing up a hill after the tunnel. 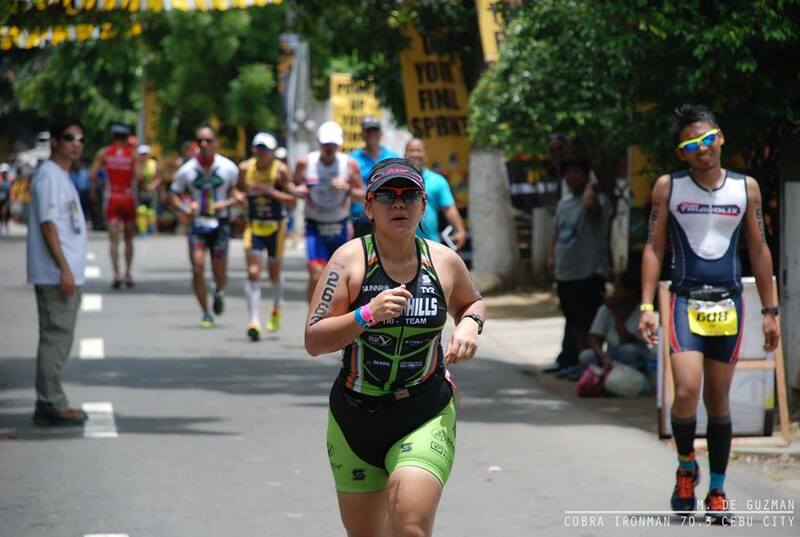 As I overtook a male triathlete, he exclaimed: Lakas! I said to myself, of course, I was trained by Berns and Candy. Haha! 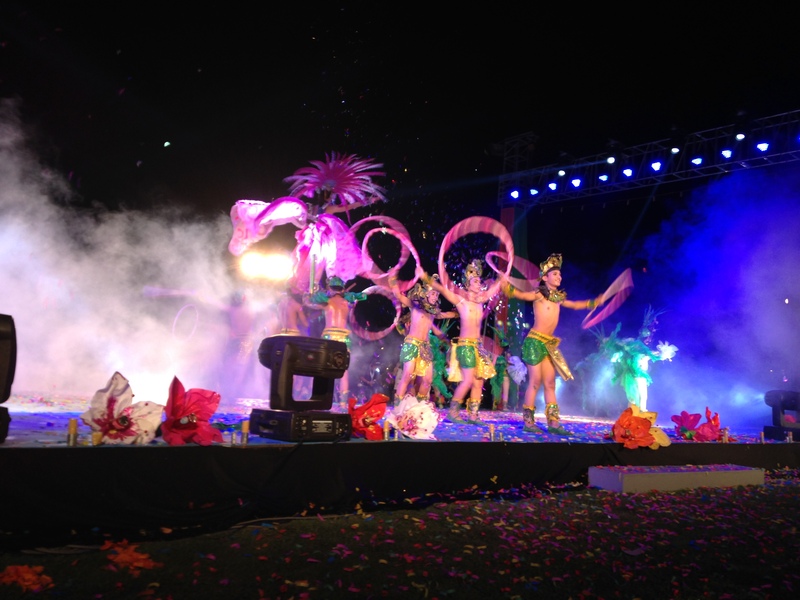 As I made my way back to Mactan after the horrible SRP double M loop, I felt recharged. I can do this! 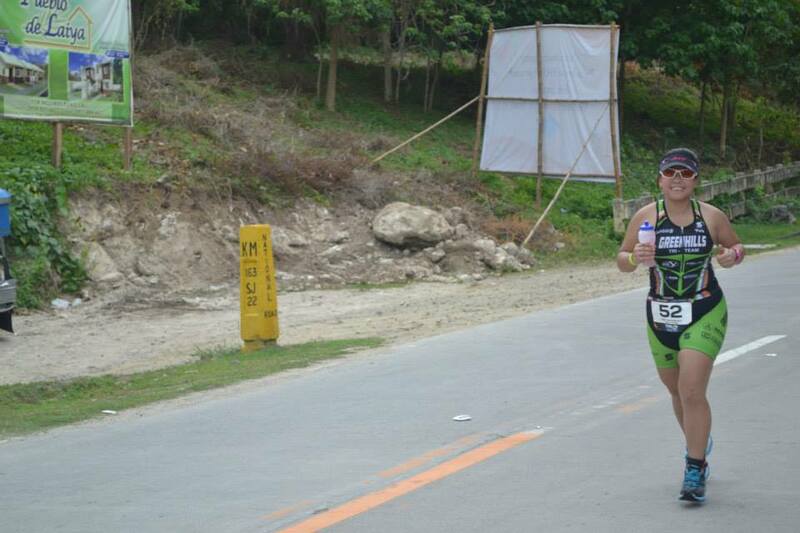 Last 10k. Do not get a flat! I saw a number of triathletes on the side of the road, some even on the center island, trying to change their flat tires. I did not have the tools to change a flat. I forgot my hand pump and my CO2 canister fell, to the dismay of hubby who spent P1.2k for it. Haha! There’s the McDonald’s sign. McDonald’s in 1.5km away. Pushhhhhh!!! I was seriously dizzy, feeling faint and felt like I was going to vomit. But this is MY event. The only leg I feel confident about. Bike mounted, helmet off, bib in front, bikes shoes off, socks on, running shoes on, handheld water – check, change shades, visor on. I drank water which felt like I was drinking warm tea. It was scorching hot. I started to look for the exit but realized that I was still wearing my gloves! Ran back to my box to dump my glove and put on sunblock on the back of my neck and my face. Shall I re-apply all over? No time. Notice the sunblock running down my neck? Haha! 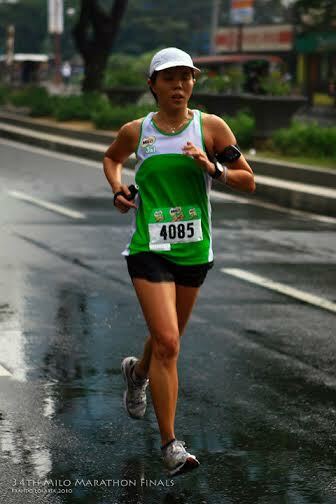 I learned from Coach Ige to pace myself during the 1st 10k of any run. So I was just chill when I saw people overtaking me. Don’t worry, we will see each other later. True enough, at km1 they were already walking. I was slowly feeling better. Slowly getting my groove back. Someone said, “hey Noy is right there!” Great! Hehe! I got you now! As soon as I saw him, I felt energized. “Hi Ny! See you later!” and started to overtake him. But he replied – “I injured myself. I lost part of my toenail.” Oh no….I asked if he wanted me to pace with him and he said yes. What should I do? 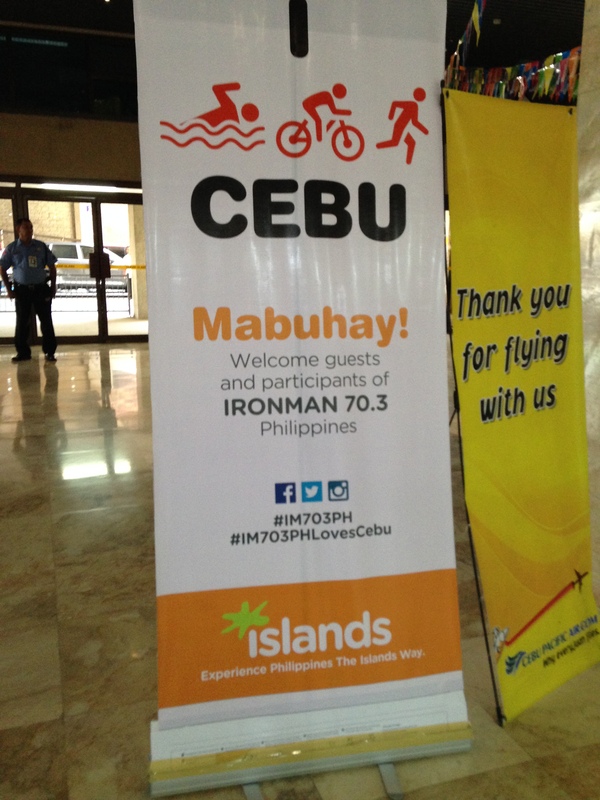 Noy said that Cobra IM70.3 would be our first and last half ironman event. We spend too much time away from the kids; it’s an expensive sport; I’m too tired. Those were his reasons. 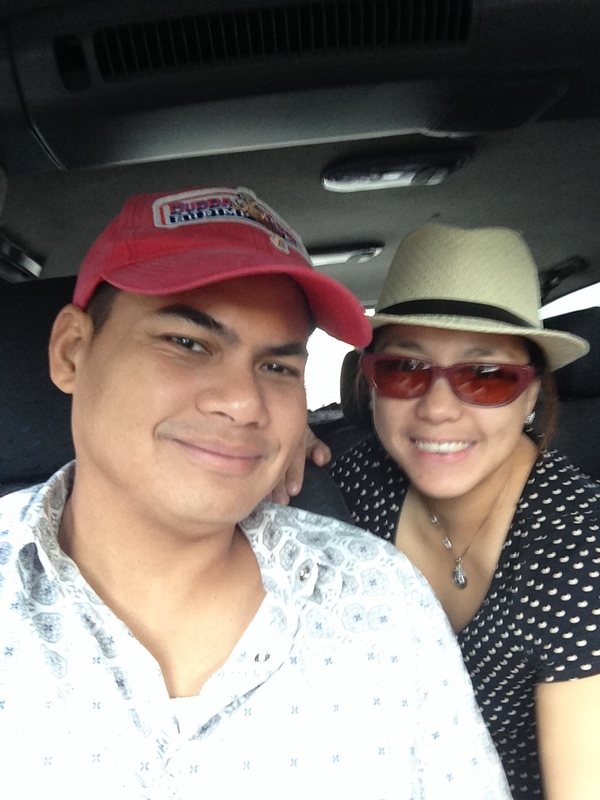 If this will be our first and last, I better make it count by making sure we both finish the race we started. I slowed down to walk with him, trying to make him laugh. I would run ahead to get him a cold of water, gatorade. Too bad I couldn’t find anymore sponges. This reminded me of the husband pacer challenge I did years back when we were still running newbies. To elude boredom and encourage Noy to follow my lead, I would run ahead and run back to him if he doesn’t followed. I tried every trip on the book. I sang for him, tried to make him laugh, ran backwards, told him jokes. I even wanted to pour ice cold water on him but he refused as he didn’t want to get his wound wet. One of the many times I left Noy to run ahead and run back to him. I was concerned that we weren’t going to make cut off. Hubby could barely run and he was having a difficult time walking. He told me to go ahead and he will meet me by the finish line but I refused to leave his side. Besides, I won’t be able to achieve my target time anymore. The run course was flat. Flat, filled with cheers and abundant hydration stations. There were serving cold water and Gatorade. Safeguard also has booth where you can get pour ice cold water to keep you warm. At the last 3k, my training buddy, Eunice caught up with us. 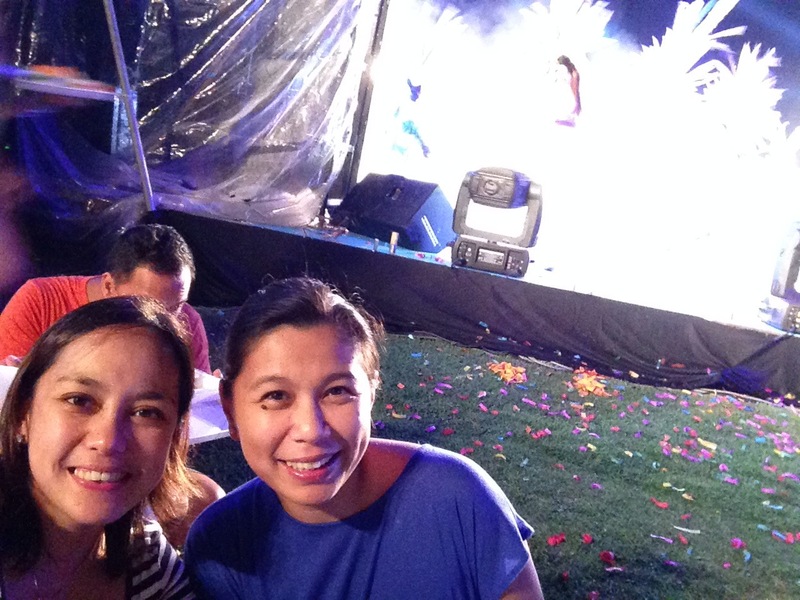 She was so happy to see us saying – Tapos ka na right?! (You’re done right?). I said No and explained that I promised Noy that I would stay with him. I told Eunice to go ahead when we reached the last 800m. We’re almost there! Wow! 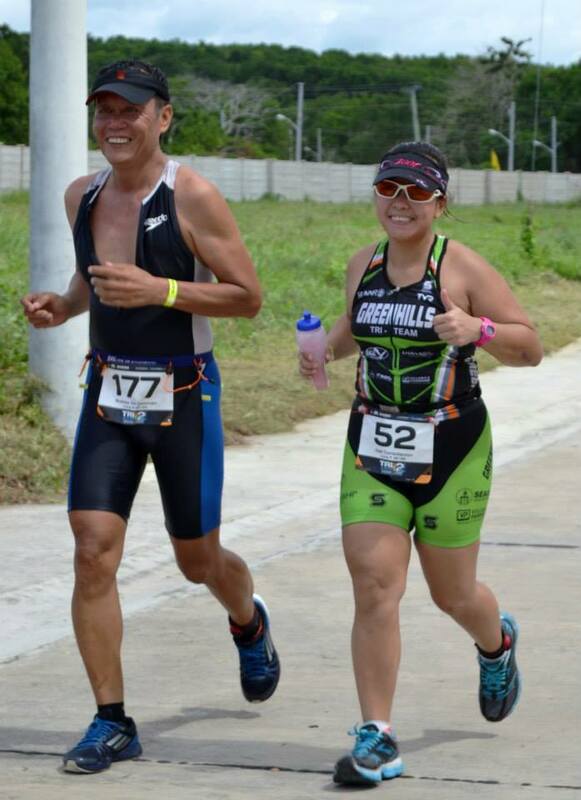 I grabbed Noy’s hand and we started our slow jog to the finish line. We heard comments like: Sweet! ; Kiss naman dyan! ; Power couple; Iron couple. I even told them that we will kiss when we get to the finish line. Haha! 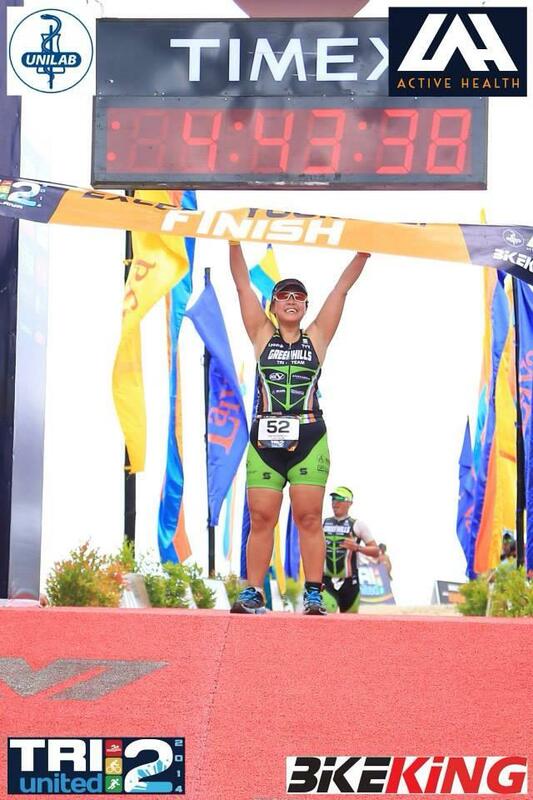 As we crossed the finish line, I realized that all the hardwork was worth it. 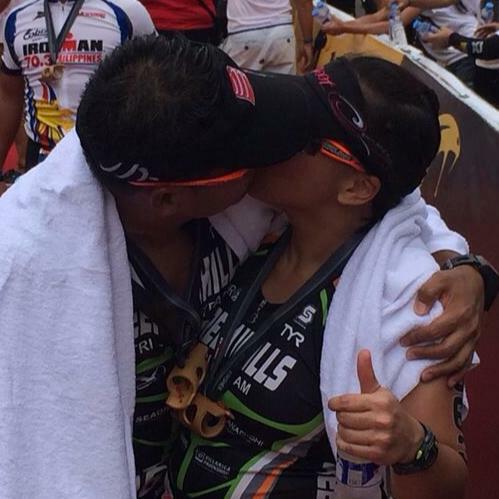 Finishing a half ironman distance with the love of your life is something to be proud of. 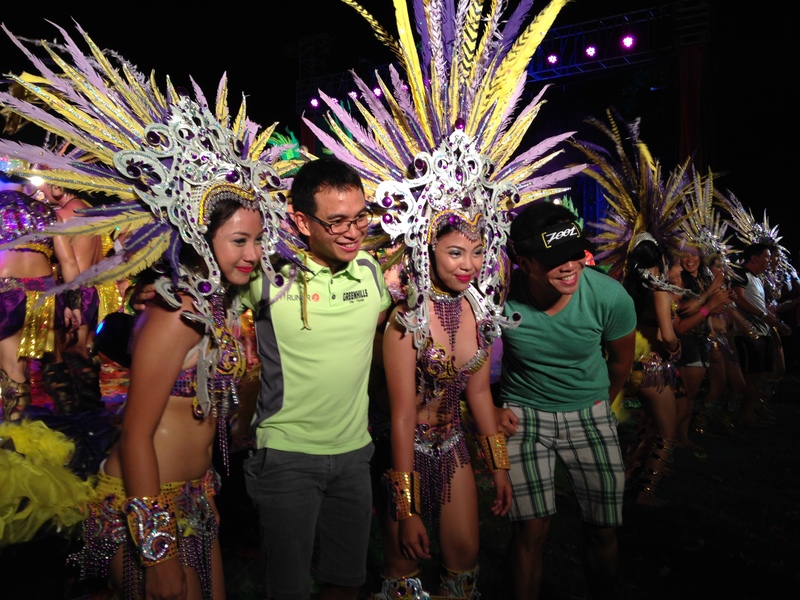 As I stared into Noy’s eyes, I said – WE DID IT! I was elated to have finished with 30 minutes to spare. It wasn’t my target time but it was a race I will truly remember. Lynette, my teammate, asked us to pose for a few pictures. At Lynette’s request, Hubby pulled me for a kiss ❤ I love this man. This I would say is a fitting end to a wonderful journey. 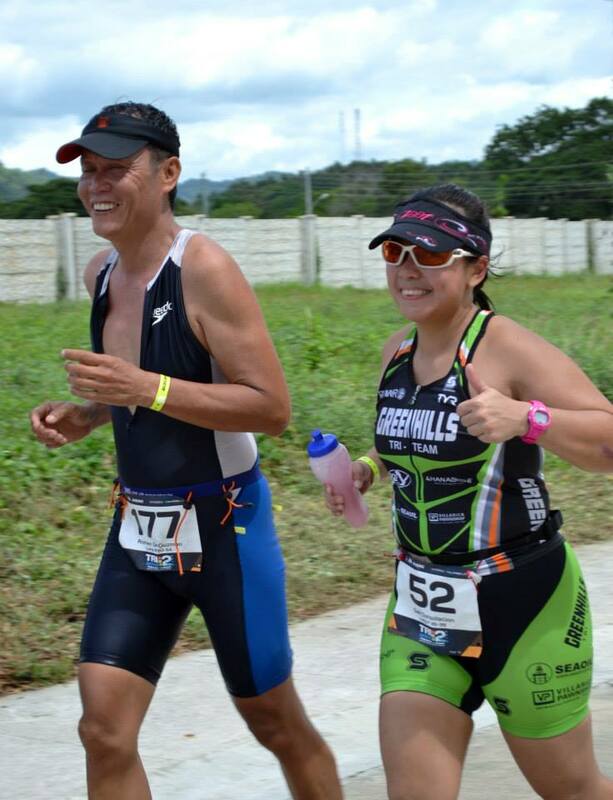 I would like to thank my family and friends – who still love me even if they don’t see me due to my “in training” status; my GHTT teammates – you guys and gals make training fun; Coaches Ige Lopez and Nonoy Basa – thank you for believing that I can do it, for your tough love that got me here; Anthony & his Rock ‘N Road family; Leeroy from Brick; Eunice and Nick; my friends from Endure & Takbo.ph; my children who understood why we had to leave so early and spend hours away from home training; my boss – Martin and his family who supported my training schedule and adjusted around it; and my husband, who did not get mad at me when I dreamt for the both of us. 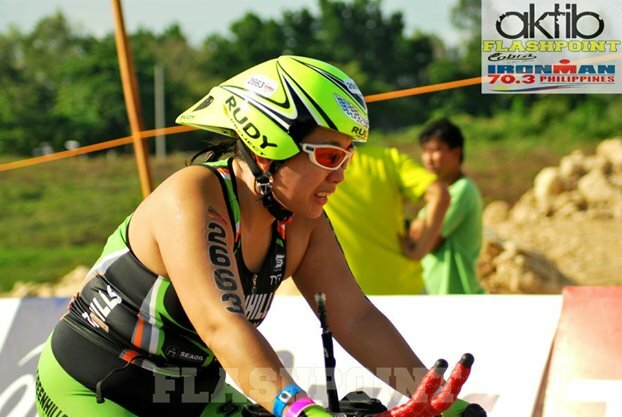 I was asked several times by friends and peers before August, will I do another IM70.3 after Cobra? I said no. But looking back, I do want to do it again. I will not settle for just a once in a lifetime but rather a lifetime of firsts. For every competition is a different experience. And that’s what makes it amazing.